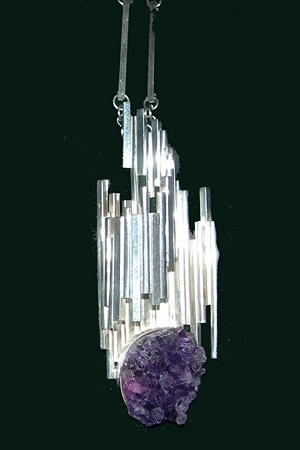 Sculptural Jewelry - This is a bold statement Sterling Silver three dimensional linear pendant accented with a beautiful geode crystal purple Amethyst gemstone. This pendant is complemented by a 24" handmade sterling silver square link adjustable chain. This Exquisite piece of art to wear is light, but dramatic. The handmade silver chain is adjustable. The natural deep purple amethyst is a beautiful contrast to the shiny polished and textured sterling silver. Signed by Aaron Rubinstein, the artist.